DUMBARTON climbed to fourth place in the SPFL Championship with a point from an exciting match against visitors Raith Rovers. DUMBARTON climbed to fourth place in the SPFL Championship with a point from an exciting match against visitors Raith Rovers at the Bet Butler Stadium. Ian Murray's men started well, and they opened the scoring with a close range shot from striker Colin Nish, but Raith equalised just five minutes later. In the 37th minute later Nish's strike partner Chris Kane outpaced a defender and netted from a narrow angle, and Sons remained in the lead until the interval. After the break Raith fought back, and striker John Baird equalised in the 57th minute, and with 15 minutes to go Smith put the visitors in front. Just four minutes later Scott Agnew restored equality with a sizzling 25 yard volley. Both sides pressed for a winner, but it was not to be. 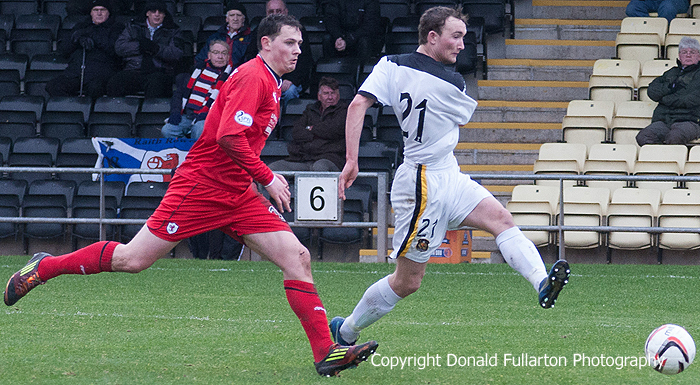 Sharing the points was probably a fair result, and the single point moved Dumbarton up to the play-off positions. The picture shows on loan striker Chris Kane netting his goal.